Ann Goldstein vividly remembers her first visit to the Stedelijk Museum in Amsterdam, in 1989. "I had a fight with a guard about the size of my purse," she says. So when she returned in January, 2010—this time as the museum's director—she had a goal in mind: "I don't want that to happen to people. I want people to feel at home." That's just one of the many objectives of this American in Amsterdam, who spent 26 years as a curator at the Museum of Contemporary Art in Los Angeles before being tapped as the first foreigner and first woman to lead the Stedelijk, which reopens on Sept. 23 after a nine-year closure. One day last spring, on a visit to New York, Goldstein framed her agenda with "four A's": "I want the Stedelijk to be alive, active, artist-centered and anticipated." Later, she added "ambitious." Long known for showcasing and acquiring international avant-garde art, the Stedelijk was founded in 1895 as a municipal museum and has employed a number of strong directors, like Willem Sandberg, who avidly collected the art of their time, from Kandinsky and Malevich to de Kooning and Nauman. Its 1895 building has long badly needed modernizing, yet as the Stedelijk's renovation and expansion stretched beyond all expectations--the original reopening was set for 2007—the museum's stature didn't so much fall as disappear. 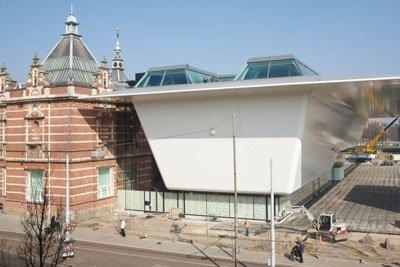 The Dutch public, angry that their tax-funded museum was taking so long to reopen, was losing patience. "We were looking for someone who could get this museum back on its feet," says Alexander Ribbink, chairman of the museum's board. Recalling the trip he and another trustee made to Cologne, Germany, where Goldstein and her husband—artist Christopher Williams, who teaches in Düsseldorf—have a home, he said they courted her based on her reputation at L.A. MOCA. "This is a museum with a huge history and huge collection without hundreds of millions of dollars at its disposal," he says, "and we wanted someone with the nose and the acumen for contemporary art to give artists their first chance, and to make sense of what's out in the art world, and to deal with the new environment for museums to get people to visit." 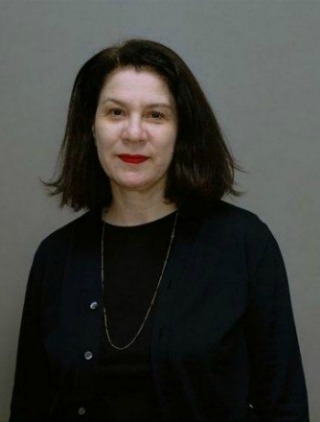 Forthright and strong-willed, Goldstein comes to the job with assets as well as liabilities.In the first column is her well-respected scholarship; she is known for organizing large-scale, deeply researched exhibitions like "A Minimal Future? Art as Object 1958-1988" [(2004) and "1965-1975: Reconsidering the Object of Art" (1995-96). In the second column, she has zero experience as a director or even a department chair. "She is very dedicated, very thorough, very rigorous," says her friend Paul Schimmel, the longtime chief curator of L.A. MOCA, who left the embattled museum in June. "But as much as she knows museums from the inside out, it's different when you are a director from when you are a curator. I think she's well-suited for it, but the other challenge—a very significant change between a privately run, museum here that was a startup versus a government-run institution with a profound history—that's harder." Goldstein knows she must navigate the difference, and says it's not just political. "There's a sense of collective ownership of the museum that is different from the U.S.," she says. "The Dutch people pay 52% of their income for taxes, and they have a sense of 'I paid for this place.'" The truth is, government support for the arts, including the Stedelijk's subsidy, is shrinking, and Goldstein and her trustees will have to seek more private money, as task she says she's eager to undertake even though the concept of arts philanthropy is new to the Netherlands. The Dutch culture is also far different from that in Los Angeles, where Goldstein, who turns 55 this year, spent most of her life and where she says "change is part of your DNA." Goldstein is adapting to the Dutch mode, which places more emphasis on history. "I'm a doer," she says. "In a Dutch organization, it's about consensus and collaboration. They want to chew on things." In Amsterdam, there is something of a wait-and-see attitude about her, even among a key constituency where Goldstein has always had a following—artists. "I think artists were generally very optimistic about Ann Goldstein being chosen for the job, as she came from an interesting place and also because she's a woman," says Jennifer Tee, a multimedia artist born in Arnhem who was chosen to participate in "Beyond Imagination," an inaugural exhibition featuring 20 artists who live and work in the Netherlands. Nevertheless, based on the 2010 show "Taking Place," the first Goldstein organized for the "Temporary Stedelijk" exhibitions in the still-unfinished museum, which included several Americans among its 20 artists, Tee says that some are worried that "she might be more interested in artists she worked with before, more than discovering new Dutch or European artists . . . but it's too early to tell." That perception of favoritism deepened, wrongly, when the Stedelijk announced its exhibition schedule, which includes a massive show, "Mike Kelley: Themes and Variations from 35 Years," set to open Dec. 15. Kelley was one of Goldstein's favorites in Los Angeles, but the museum had initiated planning for exhibition, which is being organized by German-born guest curator Eva Meyer-Hermann, years before Goldstein arrived on the scene. Praising the Stedelijk's history as an international museum, Goldstein says she'll present a balance. "People will see a tremendous amount of Dutch art when they come to the museum—great work that I'm proud we can present." As examples, she singles out a "magnificent new monumental textile commission by Dutch designer Petra Blaisse made specifically for our new entrance hall" and names several Dutch artists and designers who'll be shown in the permanent collection galleries, including dedicated galleries for Marlene Dumas, Rineke Dijkstra, de Kooning and Erik van Lieshout, among others. Goldstein is credited for reaching out to artists and curators in Amsterdam and for opening the museum as a meeting place for discussion of the government's recent cuts in arts spending. And for learning Dutch: "I surprise them every so often when I throw out a word." But she declines to take up one national habit, riding a bike. "I'm a klutz," she admits, good-naturedly. When the new Stedelijk, designed by Mels Crouwel of Benthem Crouwel Architects, opens, it will have more than 100,000 square feet of space and will, for the first time, be able to show off comprehensively its permanent collection—some 90,000 objects, including 40,000 works of graphic design—and will have adequate special exhibition galleries. That plan was fully developed when Goldstein took the job, but she still made small changes—for example, adding electrical plugs and hanging points from which to suspend large-scale artworks to the new basement gallery, which at almost 12,000 square feet is being billed as the largest uninterrupted exhibition space in the Netherlands. Notably, she disagreed with Crouwel's plan for an all-black auditorium, with one white rectangle intended for screenings. The rest of the museum's interior is famously white. She kept it white and turned the room into a multipurpose room whose four walls could be used for screenings or programming in the round. "I respect his vision, but this decision was made on the functional level," she explains. Goldstein has also changed the education department, which now goes out to schools as well as arranging on-site visits. She is beefing up the marketing and fundraising efforts; and adding more public programming. "The Stedelijk in the past was quite a meeting place for people," she says. "The intimate relationship many people had with this museum is something I hold dearly and value. It's something I want to foster." She'll need to, not least because Ribbink believes that the expanded Stedelijk should draw 500,000 visitors a year—versus 250,000 to 300,000 before the shutdown. Goldstein thinks that's achievable. "The challenge is to maintain that level [of attendance] after the opening year," she says. The museum's main entrance, instead of fronting the street, now faces Museum Square, which also opens to the van Gogh Museum and the Rijksmuseum (as well as the Royal Concertgebouw); tourists will find the Stedelijk more easily, and she is working on partnerships with the other museums. More important to her, though, is her artistic vision, as demonstrated through exhibitions. "I hope we will be opening a lot of eyes," she says.